Endoscopy and radial endoscopic ultrasound images of submucosal tumour in mid-esophagus. The submucosa is seen as a dark ring on the ultrasound image. The submucosa (or tela submucosa) is a thin layer of tissue in various organs of the gastrointestinal, respiratory, and genitourinary tracts. It is the layer of dense irregular connective tissue that supports the mucosa (mucous membrane) and joins it to the muscular layer, the bulk of overlying smooth muscle (fibers running circularly within layer of longitudinal muscle). The submucosa (sub- + mucosa) is to a mucous membrane what the subserosa (sub- + serosa) is to a serous membrane. Blood vessels, lymphatic vessels, and nerves (all supplying the mucosa) will run through here. Tiny parasympathetic ganglia are scattered around forming the submucosal plexus (or "Meissner's plexus") where preganglionic parasympathetic neurons synapse with postganglionic nerve fibers that supply the muscularis mucosae. 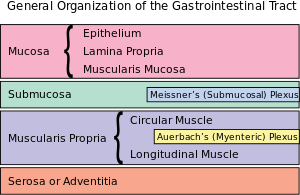 Histologically, the wall of the alimentary canal shows four distinct layers (from the lumen moving out): mucosa, submucosa, muscularis externa, and a serosa or adventitia. 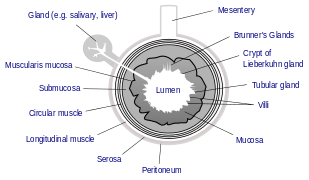 Identification of the submucosa plays an important role in diagnostic and therapeutic endoscopy, where special fibre-optic cameras are used to perform procedures on the gastrointestinal tract. Abnormalities of the submucosa, such as gastrointestinal stromal tumors, usually show integrity of the mucosal surface. 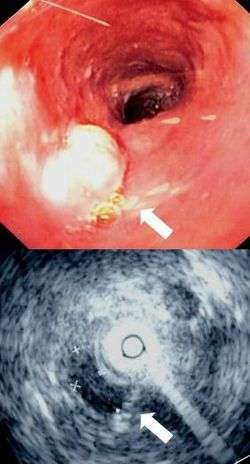 The submucosa is also identified in endoscopic ultrasound to identify the depth of tumours and to identify other abnormalities. An injection of dye, saline, or epinephrine into the submucosa is imperative in the safe removal of certain polyps. Endoscopic mucosal resection involves removal of the mucosal layer, and in order to be done safely, a submucosal injection of dye is performed to ensure integrity at the beginning of the procedure. Small intestinal submucosa (SIS) is submucosal tissue in the small intestines of vertebrates. SIS is harvested (typically from pigs) for transplanted structural material in several clinical applications, typically biologic meshes. They have low immunogenicity. Some uses under investigation include a scaffold for intervertebral disc regeneration. Unlike other scaffold materials, the resorbable SIS extracellular matrix (SIS-ECM) scaffold is replaced by well-organized host tissues, including differentiated skeletal muscle. 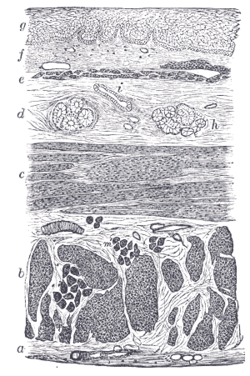 General structure of the gut wall showing the submucosa. ↑ Oelschlager BK, Pellegrini CA, Hunter J, et al. (October 2006). "Biologic prosthesis reduces recurrence after laparoscopic paraesophageal hernia repair: a multicenter, prospective, randomized trial". Ann. Surg. 244 (4): 481–90. doi:10.1097/01.sla.0000237759.42831.03. PMC 1856552 . PMID 16998356. ↑ Helton WS, Fisichella PM, Berger R, Horgan S, Espat NJ, Abcarian H (June 2005). "Short-term outcomes with small intestinal submucosa for ventral abdominal hernia". Arch Surg. 140 (6): 549–60; discussion 560–2. doi:10.1001/archsurg.140.6.549. PMID 15967902. ↑ Badylak S, Kokini K, Tullius B, Simmons-Byrd A, Morff R (April 2002). "Morphologic study of small intestinal submucosa as a body wall repair device". J. Surg. Res. 103 (2): 190–202. doi:10.1006/jsre.2001.6349. PMID 11922734.